Home / Extra-Curricular / Happy Nowrooz 2019! It’s that time of year again. The time when our shop fills with jolly Iranians and a whole load of apparently random things. We have, for your further pub quiz/crossword/general edification replicated our trusty guide to Nowrooz herebelow. Which should fully explain the random things. We are pretty much open as usual but we will be closed from 5-ish on Thursday 21st as it is Mr. Shopkeeper’s birthday amongst other things. We are still frantically shipping out new year mail orders – but obviously it is waaaay to late for them to reach you before the actual new year. Wishing you a very happy and prosperous 1398! 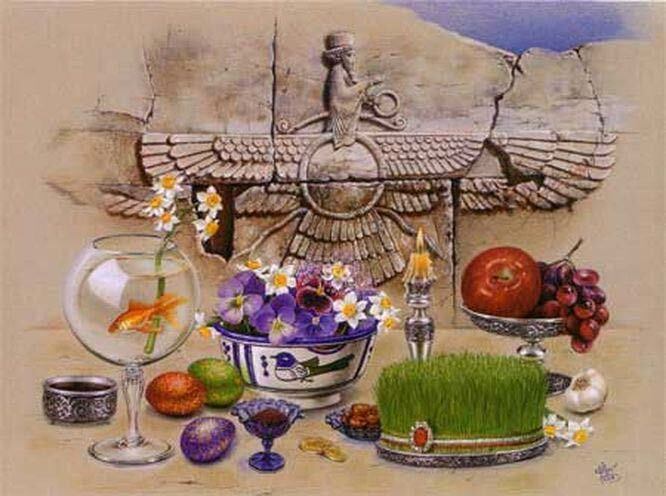 Nowrooz, or the Persian New Year, falls this year on March 20th at 21:58:27 pm. This is also, of course, the time of the spring equinox, the first day of spring. The timing is crucial – it is worked out according to the lunar calendar. This year will be 1398 – the years are counted from the date of Mohammed’s flight from Mecca to Medina. However, just as with Christmas, Nowrooz is quintessentially a pagan festival. It has its origins in the way back in the mists of time, when the generally practised religion in Iran was Zoroastrianism, and there are strong elements of superstition woven into the customs surrounding it. On the eve of the last Wednesday of the year, for example, Iranians the world over light fires which they then jump over, addressing the flames as they go, shedding their bad deeds/luck and taking strength from the fire, purging themselves for another year.